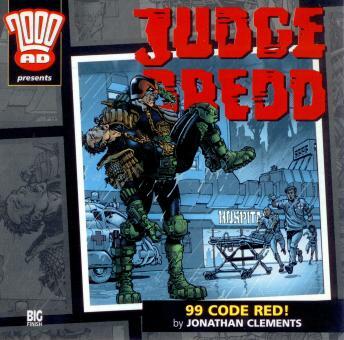 2000AD - 11 - Judge Dredd - 99 Code Red! There's a big new attraction at the White Cliffs of Dover, a Brit-Cit theme park where the inhabitants of Mega-City One can blow off steam. But the local law enforcement officers have got a grudge, because the famous Judge Dredd is patrolling on sector rotation and that means they can't be as easy as usual on the tourists. When Dredd finds arch-snitch Max Normal running for the radioactive hills, he suspects that there's more to a recent laboratory break-in then meets the eye. Someone has stolen three precious vials of a lethal plague, and they intend to release it in a public place. But as the barometer rises and tempers fray, Dredd has to call in a Code Red - the signal for a wounded Judge in need of immediate assistance. With Mega-City One in the grip of a fearsome tempest and all aerial vehicles grounded, Dredd must brave the overcrowded, understaffed squalor of Mega-City General, soon in the grip of a viral outbreak. Dredd must lock the hospital down before the occupants take the disease outside. But there are several patients who will do anything to escape, even if it means carrying a lethal virus into the streets of Mega-City One! Things are just about to get Ugly. And we mean that.